These Norwegian Pecan Cookies smell like Christmas. They are buttery and light with delicious pecans scattered throughout. The perfect finale to 12 Days of Cookies. 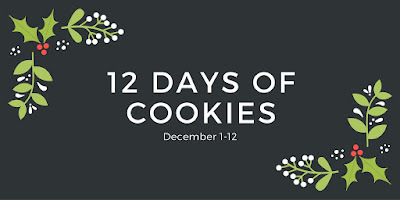 Here we are at the last day of 12 Days of Cookies. I hope y’all enjoyed reading about these recipes as much as we enjoyed sharing them with you. I hope you were inspired to get into the kitchen and cook up some of your cookies or some of ours! For my final cookie, I’m sharing a recipes that has been in our family for a while. I’m not quite sure how long, but it’s been my entire life. I think it started with my great grandmother? Don’t quote me on that. I’m sure Mom will chime in with a comment letting me know just how old this recipe is. Mom and I used to make these often for Christmas. They went along with the peppermint macaroons that we used to make. I don’t recall us being very big cookie cutter people. That was Nana. She had tins and tins of cookie cutters, which I have now. It’s funny what sets you off about lost loved ones. For me, it was the cookie cutters. I saved these for last because they are amazing cookies. They’re last because there are just some recipes that are mine. Recipes that just don’t share. These recipes are very personal to me, have been part of who I am as AKHA, and sometimes I just don’t want to share all of the goodness that is AKHA. It’s just sharing a part of me as a person and not a food blogger. Does that make sense? But, I’m sharing these. Because they truly are quintessential Christmas to me. My mother and step-father had to attend a funeral last week in Chicago. Of course, when they’re on the mainland they try to visit a few people to make the most of their trip. Mom went to visit my sister. She’s on the way home so to speak. Then she went to Seattle via Minneapolis. It was on this leg of the trip that I started making these. The timer went off and I went into the kitchen to see how they were doing. I just stood there. The kitchen smelled like Christmas to me. It had an intoxicating aroma of vanilla and pecans and these cookies baking in the oven. To me, that’s what Christmas smells like. Not pine trees. We always had a fake tree. Not spices or buttercream or even sugar cookies, though that is close. It’s the aroma of these cookies baking. You see what I mean about sharing a part of me as a person? I know you know I’m a human being and not just this persona. But I’m sure you, as a fellow food blogger or even as a reader understand, that there’s just parts of you that you don’t with everyone. Well, for this final day of 12 Days of Cookies, I’m sharing a part of me with y’all. Not only do these smell amazing when you’re baking them, but they taste amazing. They are similar to a butter cookie. Since they are made with pastry flour and extra find sugar you know they’re delicate. These cookies almost melt in your mouth. Then you catch a bite of pecan and all bets are off. Those little bites of pecan just bring a whole other level of flavor to the party. 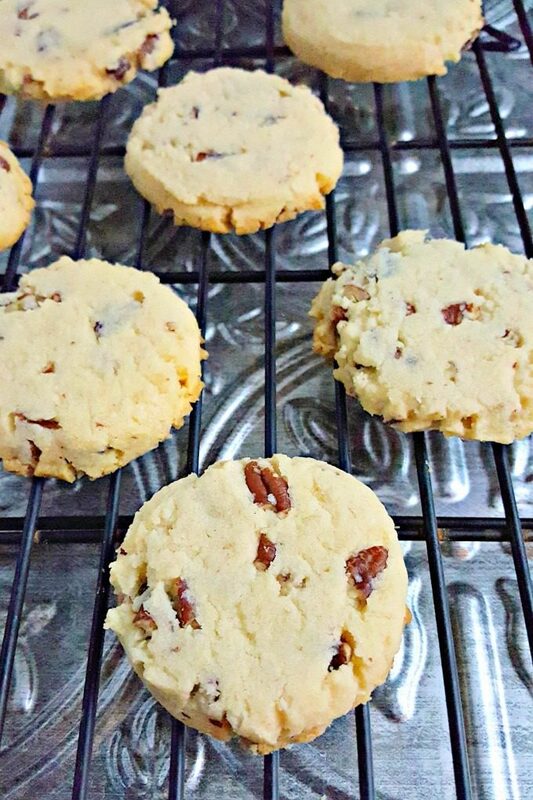 To me pecans are almost maple in flavor, which heightens the sweetness of this cookie. These are, hands down, one of my favorite cookies of all time. 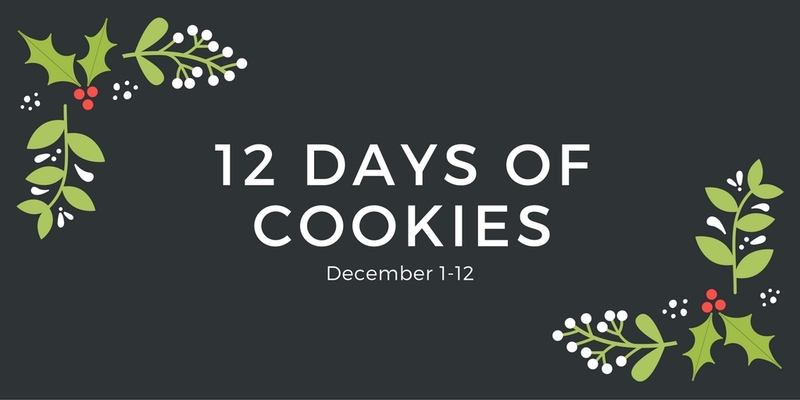 What’s been your favorite cookie recipe for 12 Days of Cookies? They’re all so good. I know it’s not easy to pick one. Please let me know if you’ve made any of the cookies we served up. And make sure you see what the others are sharing for this last day of cookie fun! Cream shortening, butter, vanilla, salt and fruit sugar together. Sift the pastry flour before adding to the butter mixture. Drop by tablespoonful onto a baking sheet 2 inches apart and bake at 325 for 15 to 17 minutes or until the edges are lightly golden brown. Remove from heat and allow to cool on pan 5 minutes before moving to a wire rack to cool completely. Store in an airtight container for up to one week if they last that long. Hi, might be a stupid question, but what is “fruit sugar”? I used to be called fruit sugar but I think it’s now called powdered fructose or just fructose. Vanilla is in the ingredients but not the directions? What is fruit sugar? These sound delicious. It’s a superfine sugar. Not a powdered sugar, but, like, three pules shy of turning sugar into powdered sugar. Thanks for sharing a delicious part of you. These cookies look amazing. I have some extra pecans in the pantry too… so these could happen this weekend! Thank you! I hope you try them. You’ll love them like I do. These cookies look so light and tender. I would love to have one with a cup of tea on this cold snowy afternoon. Thank you! They are buttery, light, and full of pecan flavor. Stay warm! You’re welcome! They’re one of my absolute faves. Yours are so much prettier than Granny’s. She rolled hers into fingers or made them drop cookies. Not sure where the recipe originated, maybe my great aunt who I called Grandma cause she raised my mom. They are truly a delicious cookie! See! Told ya Mom would weigh in on this recipe. They are very delicious!! I didn’t know she rolled hers into fingers. I don’t remember doing that. I’ll have to try that next time.